Public engagement: ask not why, but why not? 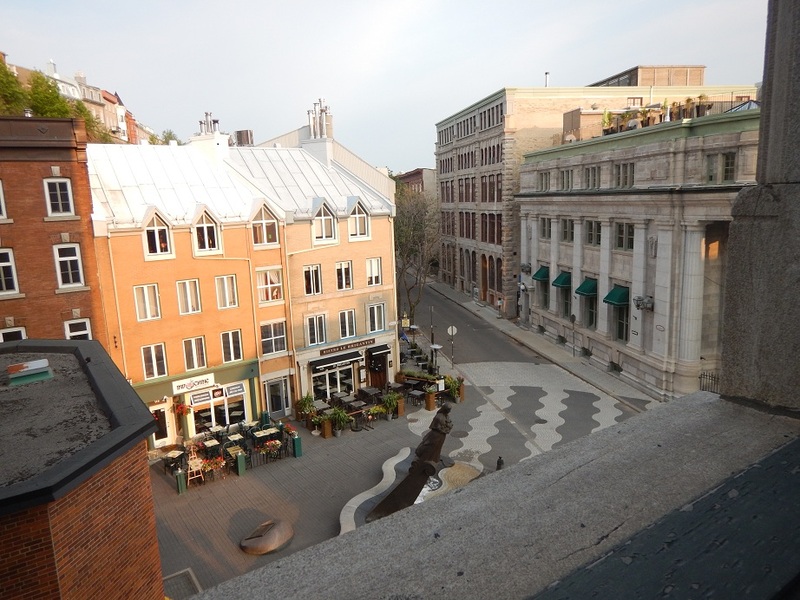 View from my hotel room, Quebec City, July 4, 2015. Yesterday’s post on the latest panic over the fictitious “epidemic” of “p.c.” on American college and university campuses got me thinking about something else I’ve been meaning to write about here on the subject of public engagement. Our students are the public we engage most frequently, so the two subjects are interrelated. Those of us who are open to and generous with our students will probably have an easier time thinking about the role that public engagement plays in our work life. Public engagement is now a component of how faculty are evaluated every year, so it’s a good thing for all of us to think about now that we’ve rounded third base of summer and are headed for home and a new semester. I’ve alluded to this before, but because the air date approaches soon, I can tell you that I was invited to collaborate and participate on-camera in an episode of “Who Do You Think You Are?” which will air on TLC at 9 EDT/8 Central on Sunday, August 30. I would encourage any historian contacted by the show’s researchers to communicate with them and share your knowledge, because unlike some other shows and cable channels that traffic in historical content–cough**TheHistoryChannel**coughcough–“WhoDo” researchers and producers take pride in learning from their collaborators and encourage us to play a role in developing the most interesting stories that a celebrity subject might want to learn about. But I’m not a prominent U.S. Civil War historian, and most of us aren’t, so why are some of us such jerks about people asking us to share our rather arcane knowledge and expertise? Are the teeming masses really beating down your doors to get to you that you can’t answer an email courteously and be open to working with a historical commission, a study group, a local historical society, a documentary film producer, or a television show? It’s pretty easy to do, and you’ll meet some nice people and have fun, so why not show people that the work you do in humanities scholarship can be fun and fascinating? So as for “WhoDo:” I said “Yes! And. . . ” and I had fun! 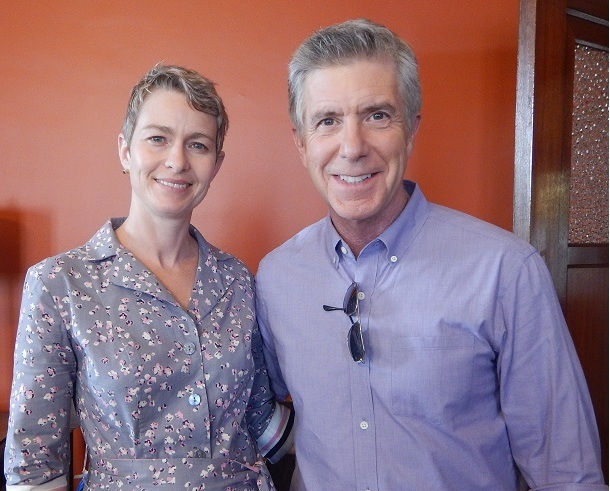 I got to meet and hang out with Tom Bergeron and his wife along with the rest of the “WhoDo” crew, who were all incredibly nice people who were good at their jobs. (How many of you can say that about faculty life in your department?) You can see the results for yourself Sunday night August 30 on TLC. I love your attitude Ann! But before you fully commit to the “Yes! And…” mode of life, I recommend that you take a moment (I take 10 minutes to 24 hours) before you say “yes” to consider whether the opportunity offered corresponds with your goals, your time, and budget. It sounds like “Who Do You Think You Are?” was an opportunity that matched your goals well. Not all opportunities will. As someone who once lived the “Say Yes to Everything” way of life (perhaps this is a different philosophy from “Yes! And…,” I can tell you that you will become very busy and gain a reputation for saying “yes.” This isn’t necessarily a bad thing, but you should also feel free to say “no” sometimes because another opportunity (often a better one) will come along if you say “yes” only some of the time. Good luck with your outreach and your new-found celebrity! I have some thoughts that I’ll add separately about why people say no, but here I’ll second Liz’s recommendation to consider. I had a request last year from a TV show to do an interview, and they were very nice about the contact, but needed me to fly all the way across the country mid-week (and mid-semester) to do the interview at their selected archive. That just ain’t happening. Well, it can’t work all the time, of course. But here’s where the “And. . . ” part is important–you don’t have to say “yes” unconditionally to every invitation or email asking for your expertise. You say yes on your terms and according to your schedule, of course–but at least try to see if you can meet in the middle. People asking for free advice/assistance or who are inviting you to be their guest are usually very respectful of your schedules. It sounds like the program you were working with was on a tight deadline & should have looked for local folks to help out on short notice. This is good advice. But I’d just point out that the “And. . . ” part is just as important as the Yes, because that’s where you can make modifications and tailor your involvement in projects to suit yourself. When “WhoDo” contacted me, it was just me and a researcher exchanging emails for six weeks or so, and then an in-person interview with the producers. Only then was I invited to be on-camera, but even then there were more emails and script review. I was happy to help/advise them–it’s not like they came to me with a proposal to collaborate and put me on camera. As you know, a lot of work can be done via email and the telephone. 1. Unwillingness to go beyond a narrow expertise. There are plenty of people who simply aren’t comfortable going outside of their self-defined field of expertise, even if it’s a “cognate” topic in which they could speak very reasonably to a public audience, even if they couldn’t, say, give a research paper at a conference about it. 3. Time/incentives. Especially for junior scholars, as you know, there are so many pulls, and an interview with a local station, though it reflects well on the individual and by extension the university, often doesn’t seem like it counts for as much, whether or not that’s true in actuality. I’m not offering defenses of any of these (in fact, I usually to encourage people with something to say to do so, especially if it’s on a topic already in the public mind), but they’re at least the ones I hear most commonly. As for your third point on junior scholars and time: this is an issue that everyone has to work out for themselves, but it’s usually the case that the invitations to do stuff come for the most part after one has published at least one book & is tenured. But it’s certainly something for jr. scholars to keep in mind. That’s excellent! A colleague of mine has done a similar bit for a UK show though, in his case, appearing on camera wasn’t an option (darn these transatlantic trips in the midst of term). I think that we can do some fairly painless public engagement in many ways. Certainly not every request is necessarily the best, but I’ve had some great opportunities come my way by being open to the outside world. Because one of my students said that I have a scary face. Well, opinons are like a-holes, right? Everybody’s got one. Maybe some TV shows are looking for scary? Or you could just do radio. I don’t like doing tv stuff– I think I must not be photogenic or something because in my brief tv experience it ends up with me taking a huge amount of time and effort (and professional make-up!) and never getting aired. (I am still irritated that the last place never reimbursed me for make-up like they said they were going to– the segment aired but I got cut… at least other places bring their own make-up person). I’m much better with radio. In terms of public engagement more generally, my job rewards it so I talk to reporters a lot, but I have friends in the same area at more selective schools who are actually looked down some if they talk with reporters, so they avoid doing it. Personally I think it’s important to get research out to a general audience and I’m glad that my department/university has the same belief. As someone who has done a good deal of television work, I want to add one important qualifier. Typically, you have little to no control over how your comments will be used in the final televised product, and little knowledge of the kinds of comments and assertions that will surround your comments on air. Which ISN’T a reason to say no; I say yes all the time. But it IS a reason to do a bit of research on the project that you’ll be contributing to and the people producing it. Because I was in L.A. last year, I was asked last fall to be an on-camera person for the History channel production, Sons of Liberty. I was willing to take a meeting, but it didn’t work out–which was good, because the show turned out to be pretty cheesy as I understand it. They totally dispensed with the talking-heads experts angle, which was probably good for both the show and the experts! I agree that control and trust are both really important. Do you trust the people you are working with and share their vision? And, are they in a position where they have enough control over the product to make that vision happen? Or is someone above them going to twist things in a ploy for ratings? I ask a lot of questions when approached, because I’ve worked for some outfits who are only interested in what a friend describes as “all those letters after your name.” Armed with that, they are going to edit you as they want, to tell the story their own way. Ideally you work with people who want the best product, and are willing to take the time to have you look at the script and also provide feedback to rough cuts. Historiann, it sounds like you had a great experience with “Who Do You Think You Are,” but that you (and the show) had the chance to sound each other out well before going on camera. This is important, because the process is all about individuals rather than networks. The problem is that television has dealt with budget squeezes in much the same way as as universities and everyone else – get rid of full-time benefitted positions, and do more outsourcing. In academe that means gypsy scholars and overloaded and underpaid part-timers. In television it means almost everyone you work with is usually a contracted individual or production company, working for just one episode or one season of one show. And, their budgets are bare bones. The only one who is a network employee is probably the series executive producer. What this means is that “good” networks can’t always be trusted, and even “bad” networks can produce good materials. It all depends on individuals. You are so right about all of this, Tad–thanks for sharing your hard-won wisdom! Most of the people I worked with on WhoDo were in fact freelancers and contract workers. And like our adjunct/non-TT colleagues, I was incredibly impressed by their professionalism and their dedication to doing their jobs right. Congratulations! I’m looking forward to seeing you on WDYTYA! There are many creative and smart journalists, and producers of t.v., radio shows and documentaries who reach out to historians precisely because historians know unexpected narratives and little-discussed aspects of a familiar topic. There are challenges to this sort of engagement. It forces those of us who tend toward lecturing (myself included) to engage in a conversation. The lack of control of the final product can be scary to some, but I think it’s part of the process. Personally, I prepare for these types of discussions by thinking about the one or two things that I would like someone to know about “Topic X,” so even if my carefully crafted examples get edited out, usually my central points come through. For me, interviews (and even behind the scene consulting) are an essential aspect of helping complicate the public’s understanding of history and historians. Thanks, Modupe–this is terrific advice. You are so right that if you do a little thinking in advance about the most important things you want a viewer/reader/listener to get, they’ll likely make the cut. The more we can do to make ourselves–and the information we offer–easy for others to get and use, the better. I’ve talked to a local radio interviewer in Denver who interviews a large number of local professors, and he has told me that some of us just don’t know how to answer a question directly or how to get to the main point quickly. Those interviews are particularly painful for him because he knows how aggressively they’ll have to edit the tape! When I was prepping for WhoDo, I made it my goal to say no more than two sentences in response to any questions Tom asked me. If he wanted more information, then I could give it to him–but if he didn’t want to know more, I wasn’t out there blathering directionless. I don’t know if I completely succeeded–we’ll find out soon enough! Great picture, first of all!!! I consulted fairly extensively for an episode of the British version of this series (or maybe this whole thing is a Brit enterprise?) last spring, and even did a bit of unsolicited internet digging on the subject. What can I say, I’m a research animal. I say yes more often than no, and if the producers in the end just don’t get it, from my perspective, I don’t worry too much about that. There’s nothing wrong with saying no, but really, read my book first…?!? and then I’ll talk to you ?!? That’s just nuts. From the impression I got last spring the research team members on these things are fairly recent first degree holders with meaningful history consciousness trying to get a foothold on something relevant, in mean occupational times, and “read my book first” is as inappropriate a thing to say to them as to a student of yours. The reply to this is right there in the series title: who do you think you are? The episode that I was talking about I think crashed and burned in a production meeting, or at least the part that I was backgrounding got cut, but that was fine. I was heading to Britain myself anyway shortly after the semester was over, and this thing kind of whet my appetite. I’ve done on-cams that I never even ended up seeing myself, on account of how I don’t have a t.v., but years later a student will see you at 2 a.m. on re-run and be impressed. Plus, what’s not cool about having an IMDb data-page? So cool!! The spouse and I love that show, so I’m excited to see this episode. You clean up nice! 🙂 Seriously, that is TV-capable. Look for a chance to volunteer to go on Rachel.